IDW's The Infinite Loop is a comic book with a unique history. It started as a crowdfunded French-language graphic novel by writer Pierrick Colinet and artist Elsa Charretier. After being funded more than 2.5 times the asking amount, the comic also got picked up for a monthly English-language release by IDW. Having stellar variant covers by the likes of Stephanie Hans and Tim Sale certainly helped, but the book has not received quite as much attention as it deserves. With the last issue hitting shelves last week and the paperback releasing in early December, it seems as good a time as any to discuss the book and its unique choice to use science fiction concepts to explore persecution and self-image in the LGBT community. 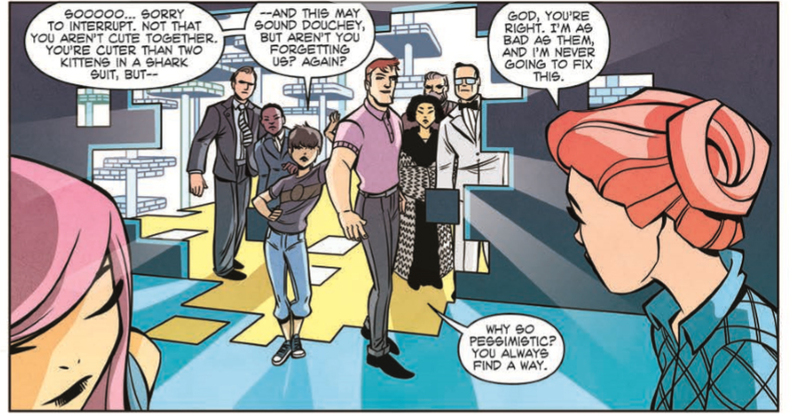 The Infinite Loop starts as a basic time travel story, the kind of which has sprung up in a lot of places lately: Teddy is part of a team of time travellers that keep the time stream safe from anomalies. There is a group of evil-doers that aren't really dealt with often–one of the few minor flaws with the book–that are causing anachronisms to pop up across time, and Teddy and her comrades have to "dispose" of everything from antique cars to dinosaurs. The story takes a turn she comes across an anachronism in human form as Ano, the girl of Teddy's dreams, and the pair goes on the run as her organization tries to hunt them down. The book increasingly takes an activist theme as it uses the infinite loop of time as a metaphor for the ongoing persecution of those who are deemed by society as different, in particular those who are not heterosexual or who identify themselves somewhere along the nontraditional gender spectrum. It's a brilliant concept that allows for both a fulfilling love story and a fiery call to arms to #breaktheloop. By the end, the story is dealing with an infinite number of Teddies and Anos across many parallel timelines working to not only live their lives freely without persecution, but fighting to fix the "loop" so that others won't have to hide their true selves either. 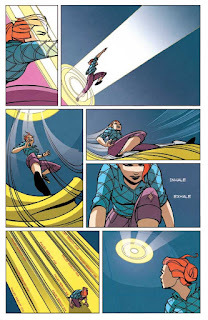 Issue six and the series as a whole has gorgeous art that makes it hard to believe that Charretier has only been at this for a couple years. 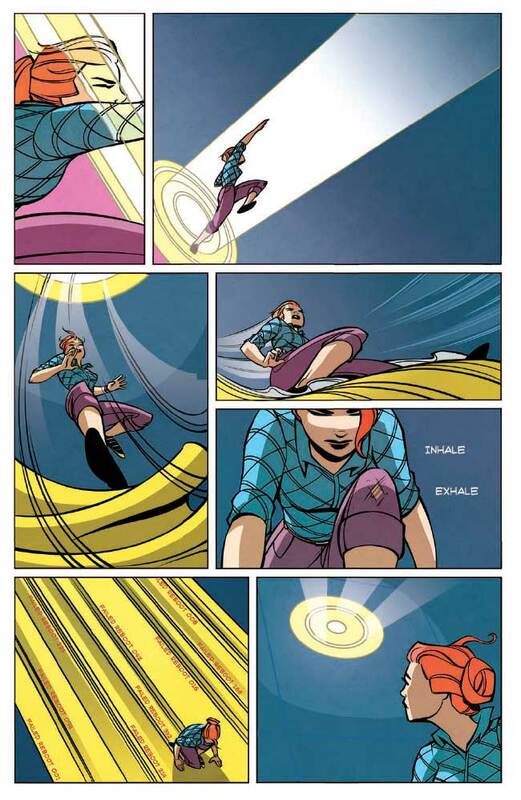 Her art has a crisp, clean line not unlike Darwyn Cooke, and as her own colorist she makes the book even more lovely to look at with a bright, exciting palette full of oranges and sky blues. There's a very nice flow to the art as well, and as a team, Colinet and Charretier do a wonderful job using not just panel-to-panel storytelling techniques, but some interesting uses of flow charts and computer code to keep the story moving. While the whole series has had overtones of activism and a powerful metaphor (not to mention the wonderful letters column that gives a voice to LGBT voices to tell their stories), the final issue allows this idea to take center stage. As Teddy dives into the time stream in an attempt to reset and break the loop that keeps people like her and Ano hiding, she flies through important moments in civil rights history, breezing by Susan B. Anthony, Malcolm X, and Patrick Henry as she weaves her way through a psychedelic whirlwind of time. Though this obviously ties in with the overall theme and purpose of the book, it does distract a bit from the story at hand, but the end that Colinet and Charretier have created for these characters is satisfying enough that the more overt thematic moments are easily forgiven. Overall, The Infinite Loop is exciting, stylish, and smart as hell. Given that I was initially sold just on the time travelling heroine and fantastic art, it was a sublime surprise to discover that the story went so much farther than that. It's a sci-fi concept that future storytellers will no doubt be slapping their heads for how obvious it is, and the execution and unique styles of the creators involved make this one both a landmark and a must-read title! 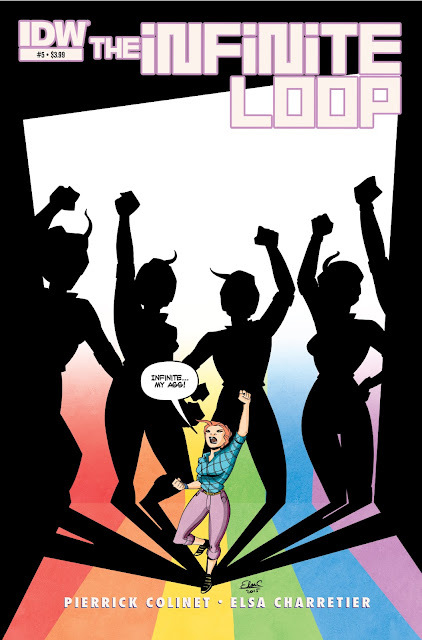 The Infinite Loop #6 is on the shelves of your local comic book store now, and is also available on Comixology. The trade paperback collecting the full miniseries releases in your LCBS soon, and will be available in bookstores and on Amazon on December 3rd.